At 67 years old, John Carlos commands as much respect modestly stood in a crowded hall in Bradford as he did on the racing tracks in Mexico City in front of billions tuning into the 1968 Olympic games. 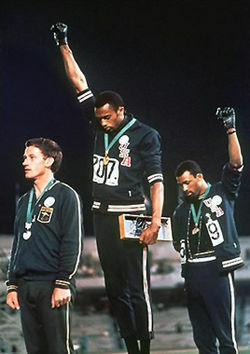 It’s not for his athletic ability however, it is his irreverent disdain for inequality and commitment to justice, prompting one of the world’s most recognised acts of defiance: the black power salute, that he is admired for. 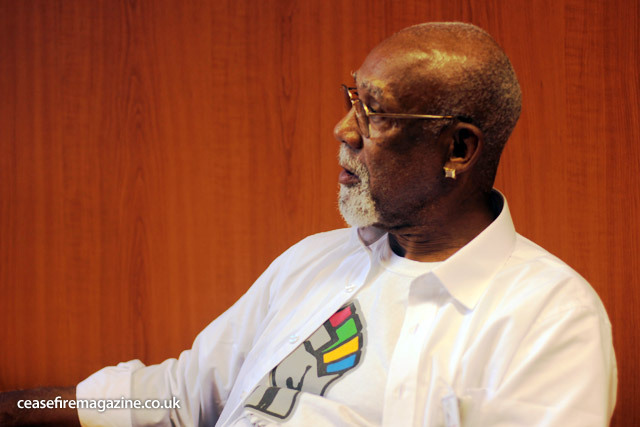 Co-founder of the Olympic Project for Human Rights, John Carlos has conducted his UK tour with simplicity, advocating unification and understanding between ethnic minority groups in Britain in order to force radical change in society. Relating the events of his past, he passionately depicts the battles faced by black communities both in the UK and the US as a perpetually dehumanising experience; it is upholding the value of equal human rights for all that allows black people to rise above this narrative, he claims. Carlos effortlessly weaves between topics, moments in time and cultural shifts, linking the introduction of drugs in specific areas such as Bradford to render ethnic minorities impotent, to the importance of affirming identity in order to benefit self, community and society at large. John was happy to speak to Ceasefire after his speech, offering his thoughts on oppression, drawbacks of the Olympic games, and the necessity of a cogent response to world inequality, through mass mobilisation and youth engagement. The full speech from John Carlos in Bradford, including an introduction by George Galloway, can be found here.